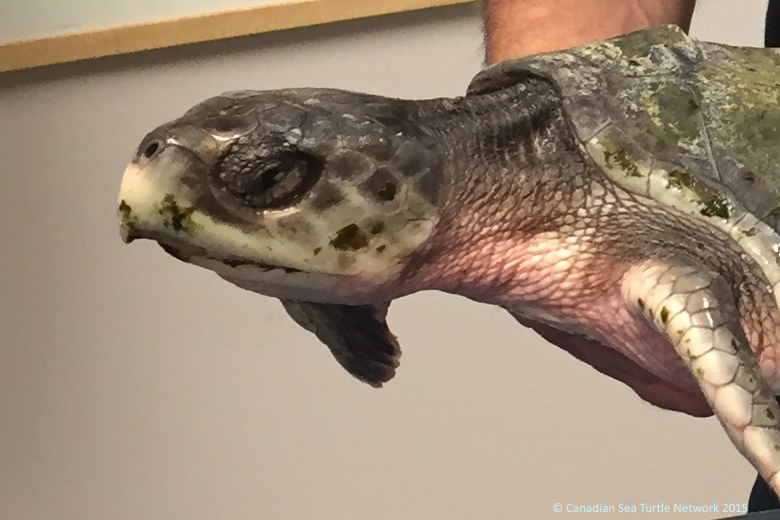 I am sad to report that Eric, the lovely little Kemp’s ridley sea turtle, has died. He couldn’t overcome the combination of emaciation, pneumonia, and the effects of hypothermia. He had so many things stacked against him. We did everything we could to help. Eric was cared for with great skill and extraordinary affection by Dr. Chris Harvey-Clark and his team. We will now send Eric to Dr. Pierre-Yves Daoust at the University of Prince Edward Island. Pierre-Yves will conduct a necropsy (which is like an autopsy) and that way we will learn if there were any additional complications Eric was dealing with. I’ll let you know what we hear. I am trying to look on the bright side. I am reminding myself that we learn something new with every sea turtle—both alive and dead—and that this is extremely important, particularly with endangered species. I am reminding myself about how proud I am of the crew at Hall’s Harbour Lobster Pound and the many other people like them in this province who take the time to keep our beaches clear of debris. Who take, simply, the time to walk them. To know the coastline. To be aware of the living place it is. And then there are the things that I am grateful for that are harder to explain. During much of the short time I spent with Eric, his eyes were closed. But when I watched him swim, they were wide open. And at one point, while Chris held him out of the water, I had a chance to look into them. There is a wisdom in those eyes that is different from our own. That knows the world in a way we don’t. What a privilege to have been in its presence. Eric swam for a bit today. We’re not letting him spend too much time in the water at this point so that he conserves what little energy he has. In very good news, Dr. Chris Harvey-Clark, the vet taking care of Eric, said that our turtle is no longer hypothermic. His temperature is in the normal range again. Eric is still fighting pneumonia, and likely will be for a while. But Chris says the biggest challenge now is how emaciated Eric is. He isn’t showing an interest in eating yet, which is a worry. We’ll see what tomorrow brings.